Haechi” is a fusion sageuk drama inspired by the myth of Haechi, a guardian of justice. It tells the story of a prince with a commoner mother who teams up with a ragtag band of people to stake his claim to the throne. Notes: Jung Il Woo has been cast as Prince Yeoning. Go Ara will be playing a brilliant inspector who works for the government despite being discriminated against because of her gender. Kwon Yool has been cast in the role of Park Moon Soo, a passionate young man who seeks justice and believes that the top 1 percent in Joseon society should hold a sword only to defend the weak. Park Hoon will be playing the role of the court entertainer, who fools around with the court gisaengs and impresses with his martial arts skills. Production company is Kim Jong Hak Production. I did not know Noh Young Hak was going to be in this. He such an underrated actor, and especially great in sageuks. I hope he gets bigger roles in the future(and that we see plenty of him here, of course). This writer is a hit and miss for me (Yi san was great, dong yi was a hit but much below yi san in terms of quality, hwajung was a complete disappointment aside from cha seung won), so here's hoping she gets this one right for everyone's sake. The cast of SBS’s upcoming historical drama “Haechi” recently gathered for their first script reading together. “Haechi” is a fusion sageuk drama inspired by the myth of Haechi, a guardian of justice. It tells the story of a prince with a commoner mother who teams up with a ragtag band of people to stake his claim to the throne. The first script reading took place at the SBS production center in Ilsan with Jung Il Woo, Kwon Yool, Go Ara, Park Hoon, Lee Kyung Young, Kim Kap Soo, Han Sang Jin, Lee Pil Mo, Nam Gi Ae, and more. Despite five hours of script reading, the actors showed shocking concentration and wondrous acting skills. Jung Il Woo, who has been cast as Prince Yeoning, perfectly immersed into his character and caught the attention with his detailed acting that was full of various emotions. Kwon Yool has been cast in the role of Park Moon Soo, a passionate young man who seeks justice and believes that the top 1 percent in Joseon society should hold a sword only to defend the weak. The actor successfully transformed into the character who is strong and witty. On the other hand, Go Ara will take on the role of Yeo Ji, a brilliant inspector who fights against injustice, and she expressed her strong personality with a calm voice during the script reading. Kim Kap Soo showed charisma by playing Sook Jong while Lee Kyung Young plays the perfect villain Min Jin Won. Park Hoon, Han Sang Jin, Lee Pil Mo, Nam Gi Ae, and other actors impressed their own parts well, adding strong support for the drama. “Haechi” is expected to premiere sometime in February 2019. Jung Il Woo filming "Haechi"
@hugo10 Thank You so much for posting the teaser and the updates. We have waited so long for Il Woo's new drama. I'm not even that much into Sagueks but I can't wait to watch this one. @0ly40 It's been awhile. Thanks for starting this thread. I'm trying to temper my expectations since this writer burned me on a few occasions(especially with hwajung...), and I wasn't really impressed with go ara's previous sageuk performance, but I'm so ready for an epic sageuk- feels like it's been forever. Plus, too many of my favorites in the supporting cast are included for me not to watch this(han sang jin, kim gap soo, im ho, noh young hak, etc). Fingers crossed! the tease looks good as everybody seems have fire in the eyes. my only complain is that we have again a lack of actress. wonder if we will see more towards the drama. i also hope that Jung Il woo charcters dont be like write as sexist towards go ara's character so they can former a nice great partnership based in trust since the beginning. The first trailer for SBS’s “Haechi” has been revealed! On January 1, viewers got their first look at this upcoming historical drama. “Haechi” is a fusion sageuk drama inspired by the myth of a guardian of justice known as Haechi. The drama will tell the story about a prince with a commoner mother who teams up with a ragtag band of people to stake his claim to the throne. 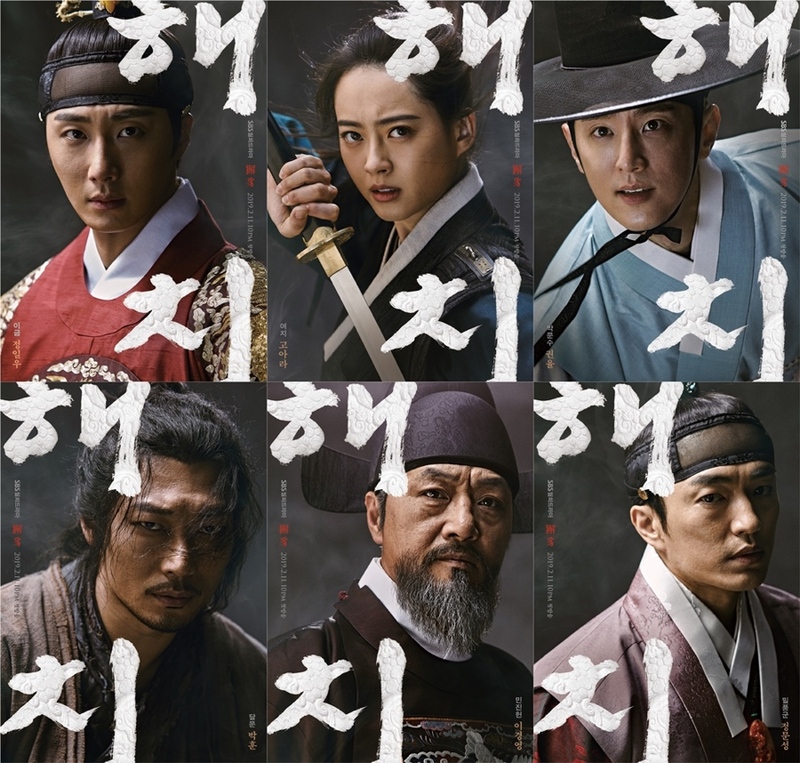 The trailer introduces its star-studded cast, including Jung Il Woo, Go Ara, Kwon Yool, Lee Kyung Young, Park Hoon, Jung Moon Sung, and more, along with the grand scale of its visual production, strong characters, and solemn music. “Haechi” will air on February 11 at 10 p.m. KST. Check out the trailer below! look interesting....didnt Go Ara just finish a drama? It's been half a year actually- looks like miss hammurabi ended middle of july.